Last Wednesday was an exciting day for the Wimmera Health Care Group and the wider Wimmera community as the first patients were treated at the new Wimmera Cancer Centre. Team members were busily moving to the Wimmera Cancer Centre over the past week to enable them to start seeing patients there as planned on Wednesday 23rd January. Acting CEO Mark Knights said that chemotherapy patients were the first to begin treatment at the new facility and dialysis patients were expected to start treatment there in early February. 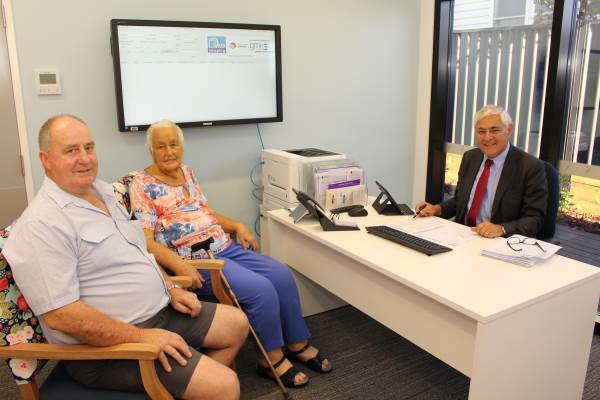 Pictured above: Prof. George Kannourakis greeted his first patients at the new Wimmera Cancer Centre on Wednesday morning, John and Audrey Klemm. Photo contributed. Mr Knights said they planned to open to the facility to community members during two community open days next month on Saturday 16th and Sunday 17th February from 10am to 1pm.